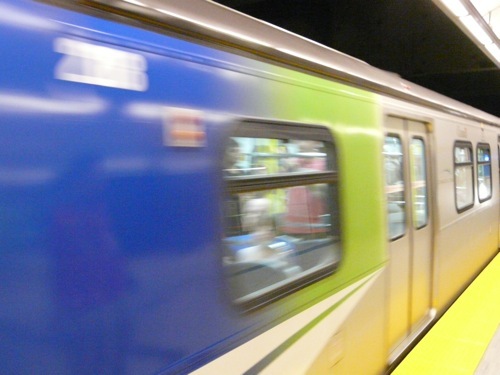 A lot of bad blood has been spilled over the Canada Line. I know as I was at the COPE meetings in the bad old days when the “Friend’s of Larry Campbell” were exiting the party. Raymond Louie was routinely hackled each time he showed his face at a meeting for casting his a vote in favour of the Canada Line, back in the days when elected officials were on the Translink Board. Given all the past controversy over the Canada Line, the mood of the opening day was festive. I stood in line with my daughters yesterday for about 2 hours to ride the new line. We got on the line at the Downtown Station one stop before the Waterfront Station; it was already full and we had to stand. Then at every station we picked up more folks. By the Yaletown Roundhouse Station I thought we were full and could not take any more passengers, but at every station we packed in even closer together. I ride the #5 bus regularly and anyone who rides that bus in the morning knows that if you are not on at the first stop you don’t get a seat. In the West End we are pretty proud about how tight we can stuff the #5 on snowy or cold, rainy days in the winter. The opening day of the Canada Line was even beyond the baseline winter #5 saga. The folks on the train were very chatty. Volunteers handed out lots of cool swag: buttons, Canada Line Opening Day Passports (one could get a stamp at every station), maps, colouring pages, fortune cookies (my fortune was: “It’s safe to talk about rapid transit” –huh? ), and info sheets. Folks will be talking about the Opening Day of the Canada Line in years to come, but probably not in English. I was struck about how diverse Vancouver is. Already more people in Metro Vancouver have a first language other than English. It was fun to be packed like sardines with folks whose origins were from all over the world. There was a real sense of civic fraternity on the train. I know that I am gushing about my experience yesterday, but I felt a real hole in the cultural enclaves in Vancouver begin to open up.